More humanoid Khajiits and Argonians, made to look ‘cuter’ than their vanilla counterparts. This was a request from a friend of mine that ended up being expanded upon to include more eye colours and 3 more fur variations. Recently I decided to join it with a side project, my Kawargonians. Now you can add the Kawa-Khajiit, the Kawargonians, or both! The base version (main file) supports HGEC for females and RM for males. There is no vanilla support, because really, who still uses the vanilla bodies? This is NOT a race-replacer. The four races are separate and will NOT interfere with the original Khajiit race in any way. A replacer for both will be made in the future. 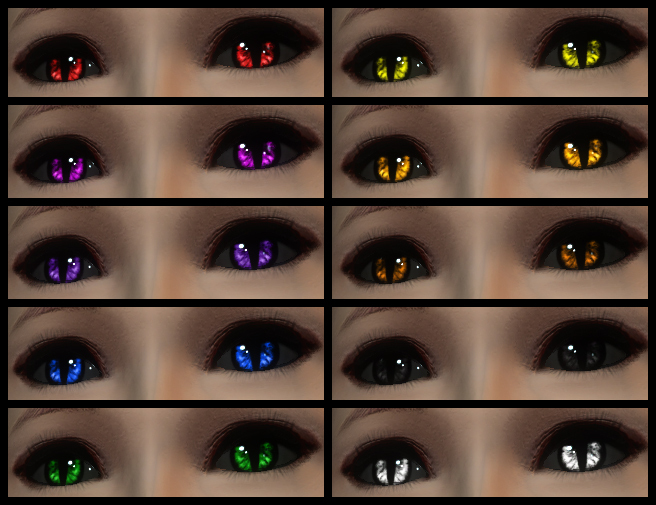 This race has a unique set of eyes based off idkrrr’s Corean eye texture, and are available as normal or glow versions. 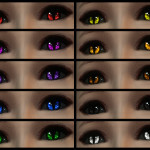 There are 20 eye choices in total. There is a wide variety of hair choices for this race: 19 hairs from Ren’s Beauty Pack, 56 hairs by idkrrr (from the Corean, Saram and Sul Hwa races), 14 hairs from KumaKumaKokuma’s Lop Ears Elf race, 20 hairs from HISSSA’s hair pack, 26 hairs from the 2CH Hair Explosion set (Pr-ttyCure), 8 hairs converted from The Sims 2 by Sulpyun, 5 hairs by VanillaBeans, 7 hairs by RAN and 6 hairs converted from The Sims 2 by Fallen20 for a total of 161 hair choices. All hair is available for use by males and females. Start Oblivion Launcher, click Data Files, uncheck MissAniThrope’s Kawa-Beast races.esp OR MissAniThrope’s Kawargonians.esp OR MissAniThrope’s Kawa-Khajiits.esp, depending on which one you installed. Version 1.1+: This mod has been thoroughly tested and cleaned to ensure that there is no incompatibility with any other mod barring any older versions of the Kawa races. This mod Kawa-Beasts download link is broken. Its not possible to download. I did however a search with google and we can download it in http://missanithrope.com/temporaryarchive.php there it works fine. Will a replacer be completed soon? Finally tracked down one of my favorite mod authors after all those years! I absolutely adore the work you have done for this ol’ game, Ani, and i am happy to see you actually have a site with even more mods that i haven’t found before. I first saw your work when i stumbled across a mod called “desuchan’s kawa-khajiits”, which gave me the widest jaw drop i have ever experienced. It was the first mod i’ve found to have characters with decent, well-made faces, that didn’t look like irradiated mutant potatoes, and i was plenty happy about it for a good while, got a kawa-khajiit character over level 100, lived a happy life as the new sheogorath and became the arena grand champion quicker than Owyn can say “lop your arms off”. I am so excited for this to be a replacer!!! Um, I can’t seem to locate the body patches. Are they still available? Thanks.